One of the most revered spiritual journeys of Hinduism, organized every year, the Kailash Mansarovar Yatra 2019, is going to start from 20th April to 26th September 2019. Although full of challenges, the holy yatra Kailash Mansarovar lures numerous devotees from all around. One of the important pilgrimages for the Hindus, the Kailash Mansarovar Yatra is a life-changing experience. The arduous sojourn takes pilgrims one step closer to their Lord Shiva. The Yatra takes the devotees to Mount Kailash and Mansarovar Lake. As per Hindu scriptures, a dip in the holy waters of the Mansarovar lake and a parikrama (circumambulating around) of the Kailash Parvat aids in washing away all your sins and getting freedom from the cycle of birth and death. Indian citizens, above 18 years and below 70 years can embark on the Kailash Mansarovar Yatra 2018 that takes you the holy abode of Lord Shiva and his consort, Goddess Parvati. Overcoming the hurdles of previous years, the Kailash Mansarovar Yatra 2018 will commence from three routes. Kailash Mansarovar Yatra by road from Lipulek Pass is suggested for the youths and devotees who are interested in trekking. The Yatra will be conducted in 18 batches comprising of 60 pilgrims each. Each batch has to complete the Yatra in 24 days including 3 days in Delhi for preparatory work. You will be covering important sites like Patal Bhuvaneshwar, Narayan Ashram, etc. The charm of Chialekh Valley, or the ‘Om Parvat’ which has the natural occurrence of snow in the shape of ‘Om’ on this mountain, spellbinds the pilgrim. Going on Kailash Mansarovar Yatra by road from Nathu La is best suited for senior citizens who wish to avoid trekking. The route is an easier one as it is easily motorable. The Yatra from this route lasts for 21 days again including 3 days in Delhi for preparatory work. 10 batches of 50 pilgrims each are scheduled for the route this year. Cover the scenic places like Hangu lake en route get mesmerized by the vast landscape of the Tibetan plateau. Pilgrims are free to choose can select only one of the routes or both, depending upon their preferences. A route and a batch will be allotted to them through computerized draw of lots. However, if you couldn’t make into the draw, there is a third route as well. Besides the two routes mentioned above, Pilgrims can go on Kailash Mansarovar Yatra from Nepal. The yatra via this route can be completed via two means which are mentioned below. The 14 days Kailash Mansarovar Yatra by road from Nepal lets you explore the attractions of Kathmandu. Partaking in all the rituals at the Mansarovar and Darshan of the Gauri Kund is a memorable experience. 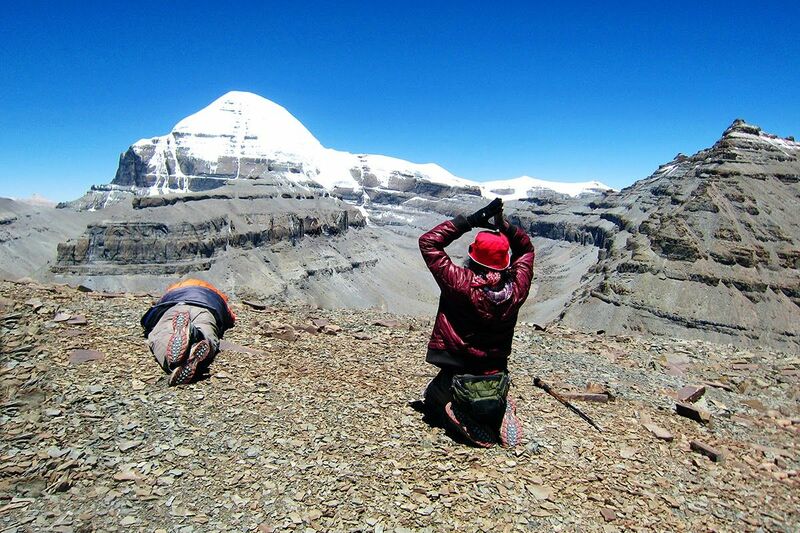 Take a holy dip in the Mansarovar Lake and circumambulate around the Mount Kailash. This road journey is soul cleansing and picturesque. Kailash Mansarovar Yatra, the journey to salvation can be undertaken via this means as well. Kailash Mansarovar Yatra by Helicopter from Kathmandu, Nepal offers a wonderful experience of picturesque sights, challenging treks and spiritual bliss. A flight from Kathmandu takes pilgrims to Nepalgunj and then to Simikot. The 11 days Yatra covered amazing destinations offering splendid views. Choosing Kailash Mansarovar Yatra by helicopter from Kathmandu gives enough of the time to explore the wonderful destination. You can also perform your rituals to your heart’s content to please the deity. Undertaking Kailash Mansarovar Yatra by road can include some challenges. Thus, to save your pilgrimage from being affected by those hurdles you can chose Kailash Mansarovar Yatra by helicopter. Culminating in just 9 days, Kailash Mansarovar Yatra by helicopter from Nepalgunj inundates pilgrims with a divine bliss. Wash all the sins of your lifetime with the darshan of the Mt. Kailash. Take a holy dip in the blessed waters of Mansarovar Lake. Wonderful scenic views are the other highlights of the journey. Another advantage of choosing Kailash Mansarovar Yatra by helicopter from Nepalgunj is that saves from challenging treks en route. So, if you also want to go or take your parents to the Kailash Mansarovar Yatra in 2019, start planning for the same.